Like most of the DSOs placed prior to production starting at San Jose, the 1967 G.T. 500 Convertible (0139) was on its own dedicated order form. The form was the same multi-part NCR form used to order every '65, '66 and '67 Shelby G.T. from Ford Motor Company. For a clearer & larger picture of what the Ford Special Order form looks like, open your 2011 SAAC World Registry 65-66-67 and turn to page 1325. The following is a transcript of the typed and handwritten information taken from the this car's Ford Special Order form (DSO 71 002512). Gaining access to the orders on microfilm has provides great insight as to how the first '67 Shelby G.T. cars were ordered. Yes, parts were 'deleted' from the standard Mustang build, but not nearly as much details as would become the norm as the add/delete list process evolved. This order was created before '67 Mustang production started at San Jose, so Gerald W. Nuznoff, the man responsible for the orders, would have modeled the order more closely to what he had ordered previously with the '66 Shelby cars and upon what he anticipated for the '67 cars. The Special Order (FSO/DSO) form is different than the Ford Vehicle Order and Specifications form (SVO&S, aka "add/delete sheets"). The FSO is a landscape-oriented form #FD 6243. SVO&S and the SVO&PS sheets were portrait oriented forms. Dealer Name Shelby American, Inc.
"N.A. Subject to Test Results"
Engine, 8 Cyl. Ford Cobra 9-29-66 E.J. Dual Exhaust System to exit below Rear Valence Std. Wheel, Steering – Standard (Black) Std. Stabilizer Bar, Front (Suspension) W/.94 Diameter and Mtg. Hardw. Moldings – do not drill holes for Emblem Deletions. 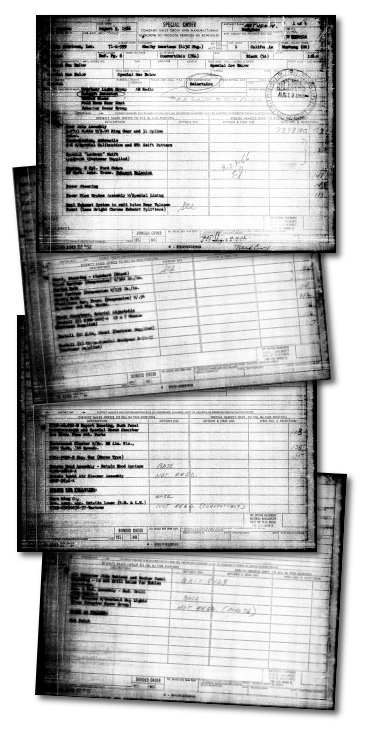 Special Order Supplement "(Change Notice)" documents were also part of the complete Ford record. The following supplements are associated with the early cars, including the convertible. This car's DSO itemized the black comfort weave (5A) trim, however, the Ford Record indicates this car received smooth black vinyl (6A). We strongly believe that this was due to the comfort weave material not yet being available when production commenced. Beginning with DSO 2513, the deck lid (trunk) was added to the list of "deleted" items.